Probably the Consecration. It's expensive as hell even here in the states. Russian River is one of the best brewers on the planet though so I bet it was fantastic. I'm going to agree with Jay. Check the batch number on that Consecration then check it online, that may have something to do with it. Those are great beers though (minus the Tripels, not a Tripel guy), you just inspired me to spend over $40 on two bottles of Pliny the Elder off eBay since I've been waiting years to find one on the East Coast and have never seen it once. It's batch 6, which is the latest. But this is Japan, and Tanakaya is the only place you can find anything like this (more or less). Hence the price me thinks. I'll save it for a special occasion. I use to love Tanakaya. Great selection and reasonable prices. Oooh. Consecration. Nice GET! Really hard beer to find. I've had a sip just once, and it was great. It's a sour beer that's been aged on oak, I believe, so you can age it for a while and then enjoy it. It's puckeringly sour, so just be prepared for it. That style is really popular in the states these days. The Consecration was really, really nice. Like a champagne. But no way would I regularly be able to afford a $40 bottle of the stuff. 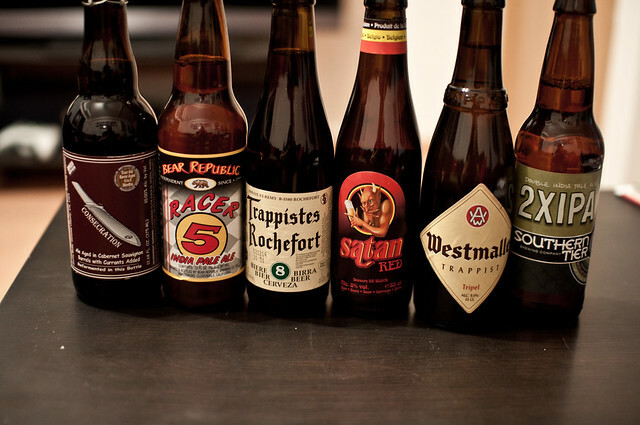 Rochefort and Westmalle are Belgian 'Triple' beers. High in alcohol and nice taste. Not a beer that you will drink all night, like lager. And the price is high, even in Belgium.